Once enabled the Clipmaker tab will display at the top of the page. Click on Clipmaker to start a new project. Next name this new Clipmaker project and set the project Ownership to either Private or Shared. Name and Ownership can be edited after the project is created. Choose to either include All or specific folders only for Select Resources. The resources included in your project cannot be edited after the project is created. After configuring the project, click Create. 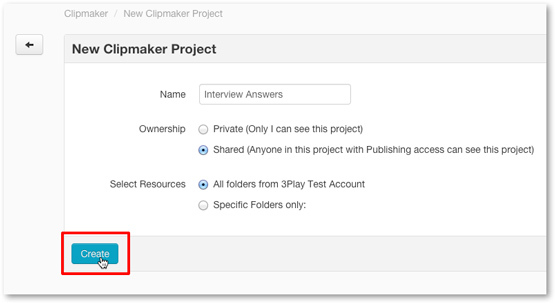 After clicking Create you will be directed to the Clipmaker project management page. Click Open in Clipmaker to begin creating new clip reels and saving them to this project.